We all knew it was coming ... it happens every month on this date ... and yet earlier this week, gardeners around the country (and perhaps around the world) could be heard lamenting the fact that May 15th seemed to have sneaked up on us. 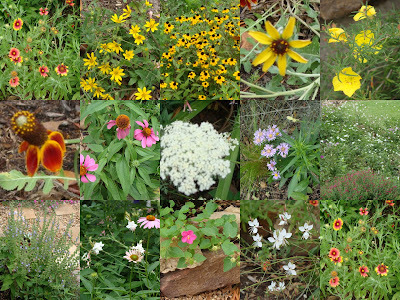 That's the official date for Garden Bloggers' Bloom Day, hosted by Carol of May Dreams Gardens; due to heavy gardening activity, I'm late posting about what's blooming on my corner of Katy. 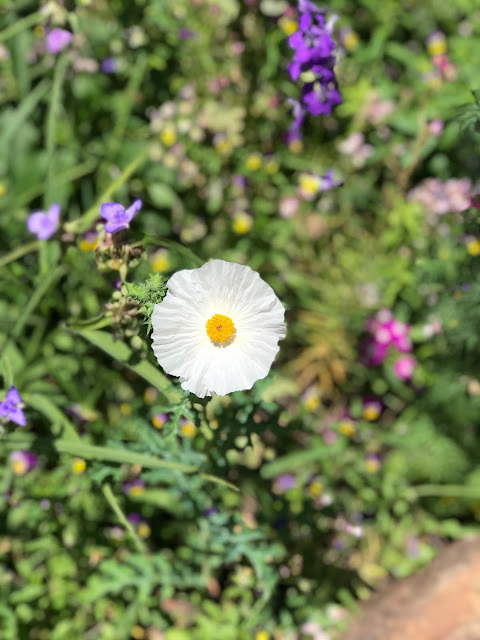 May is a pretty floriferous month here: I took over 100 pictures as I wandered through the gardens earlier today and still didn't capture everything that's in bloom! The beauty below is Triumphator, a lily that's a cross between an Oriental lily and an Easter lily. The Houston Chronicle's Kathy Huber had this to say about it last year: Triumphator lily (Lilium longiflorium/Oriental hybrid): Absolutely the best? This outstanding 4-foot-tall naturalizing lily carries huge, wildly fragrant flowers. They're great for cutting, and the thick petals are especially long lasting if you remove the pollen anthers after the flowers open. Plant in a sunny, organically enriched, well-draining bed. The stems are thick so the plant rarely needs staking. Expect blooms around Mother's Day. Allow the foliage to die down in the fall. Bulblets will form, increasing the clump size. This plant is doubly special because it was a gift from my friend Tricia, who I met through my late friend Amy. Tricia and I made a trip out to Enchanted Forest last month to check on the progress of the tree planted in Amy's memory; we found this there and Tricia decreed that I must have it. I am so happy she did ... thank you, Tricia! 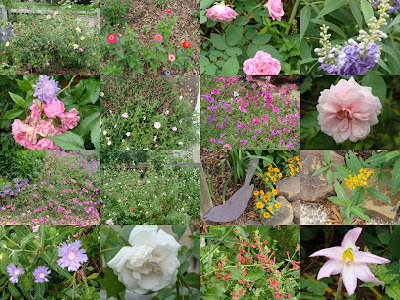 Some gardeners prefer the old fashioned flowers, as seen below: Mutabilis rose, Zinnias, Hermosa rose, Vitex, Gartendirektor Otto Linne & Scaiosa, Evening Primrose & Pink Skullca0p, Verbenas, Souvenir de la Malmaison, more Verbenas, Hot Lips Salvia, Profusion Orange Zinnias, Butterfly Weed (Silky Gold), Stokes' Aster, Madame Alfred Carriere rose, Texas Betony, and a Pink Rain Lily. 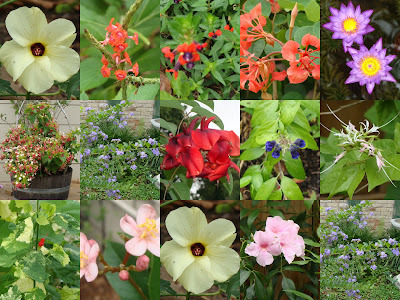 If tropicals are more your thing, here's a few of those for your blooming pleasure: Pineland Meadows Hibiscus, Coral Porterweed, Batface Cuphea, Bauhinia galpinii, Tropical Water Lily Lindsay Woods, Rangoon Creeper, Duranta, Erythrina crista-galli, Royal Purple Skullcap, Mexican Bauhinia, Variegated Turk's Cap, Pink Jatropha, Hibiscus again (@#$* Picasa! ), Bower Vine, Duranta AGAIN? I've saved the best for last, or at least what I'm most excited about this Bloom Day. This is my Oakleaf Hydrangea. She's been in this spot for about 3 years now and this has definitely been her year to shine! Ok, now I know what hybrid Lily I want. Triumphator clearly has it all. I think I've grown some of those Daylilies. Is that 1st one 'Prairie Blue Eyes'? It's odd to me that your Oakleaf Hydrangea is in full bloom. Mine is just putting out leaves. Yours looks wonderful. You are justly proud. My goodness that is a lot of bloom! Your corner does shine in May. Happy Spring (or nearly summer for you). your blogging is almost as good as your gardening. i'm blown away by both of your amazing talents. congrats on such beautiful efforts. Cindy, your yard is like a botanical garden! And I've been wanting an oakleaf hydrangea now for three years but can't seem to find one in any nursery around here. I guess I'll have to break down and special order it in the fall, now that I've seen yours. And those daylilies! Wow. 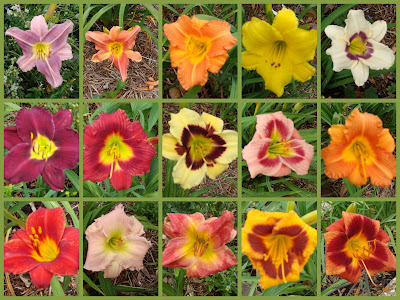 Wow...your daylilies look like a catalog...there are so many! Actually so many of everything! I wish we could do the flue powder thing and see it in person! This is an overwhelming amount of plants in bloom, Cindy, and at least picassa didn't turn your photos sideways like blogger does. You have so many lovely daylilies and the Triumphator is spectacular. I've heard varying answers as to whether an oakleaf hydrangea would grow well here, but your photo is making me want to try! WOW - love the pics and commentary. Working hard to get my new, bare Cypress backyard looking half as good. Additionally to, we provide lessen Viagra pharmacopoeia, which is kind of impressive in make use of than other popular Cheap Discount Cialis Pharmacy On-line Erectile dysfunction Viagra apothecary online drugs. We are ready that our comrades Procure Cialis Detract from Drugstore is solitary of the a- in the Internet, commonly, discount Cialis Online specializing on online pharmacy Cialis. We are to death that our attendance Obtain Cialis Discount Apothecary is one of the a- in the Internet, commonly, Best Discount Viagra Pharmacy Online specializing on online chemist's shop Cialis.